The new Senran Kagura has officially been revealed (via Famitsu), titled Senran Kagura: Peach Beach Splash. The brand new title will be a team based third-person shooter, with both online multiplayer and a story mode. The game will include a cast of 30 characters, including fan favorites from the online card game Senran Kagura: New Wave Burst G.
NIS America has announced a PC release for Criminal Girls: Invite Only. The game was originally released on PS Vita – now it’s getting a Steam release on January 11th of next year. 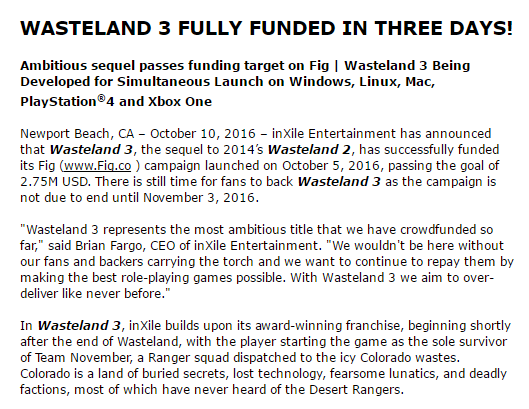 inXile Entertainment has announced that Wasteland 3, the sequel to 2014’s Wasteland 2, has successfully funded its Fig (www.Fig.co ) campaign launched on October 5, 2016, passing the goal of 2.75M USD. There is still time for fans to back Wasteland 3 as the campaign is not due to end until November 3, 2016. "Wasteland 3 represents the most ambitious title that we have crowdfunded so far," said Brian Fargo, CEO of inXile Entertainment. "We wouldn't be here without our fans and backers carrying the torch and we want to continue to repay them by making the best role-playing games possible. With Wasteland 3 we aim to over-deliver like never before." Valve has announced that the PS4 DualShock 4 controller will soon be fully supported through Steam thanks to an update that’s on the way. The update in question will let players map the controller to their liking, including the DualShock 4’s touchpad and gyro abilities. At this point in time, as a reminder, some Steam games do have limited support for DualShock 4 controllers, but they are far from ‘full’ support – several games still require using a third-party program, and even fewer let you customize the controller, let alone use the touchpad and gyro capabilities of the controller. With this new update, Steam will support the controller for all games. Other controllers were also mentioned to be receiving support down the line, but the DualShock 4 is the first to get the support – mostly due to the similarities in functionality to the Steam Controller. Tiny Metal, the new turn-based strategy game is set for a release on PC, Mac, Linux, and PlayStation 4, and will be published by American publisher Area 34 sometime in June of next year. Kikuta-san will be overseeing the entire development of the game, with I Am Setsuna composer Tomoki Miyoshi. The team is described as being made up of “grizzled Japanese veterans” including Kikuta and Miyoshi, however most are currently unable to reveal their identities due to obligations to existing employers. Talent agency Aoni Production announced on its website on Tuesday that voice actor Kazunari Tanaka passed away on Monday due to a hemorrhage in his brain stem. He was 49. Tanaka voiced roles in such anime as Haikyu!! (Keishin Ukai), Planetes (Hachimaki), Marmalade Boy (Tsutomu Rokutandou), Hell Teacher Nube (Katsuya Kimura), Code Geass: Lelouch of the Rebellion (Shinichiro Tamaki), Freedom (Dorowa), Soul Hunter (Kou Hiko), Tenshi na Konamaiki (Ichiro Fujiki), Brave10 (Miyoshi Seikai Nyūdō), Gintama (Kato Ken), Mobile Suit Gundam Seed Destiny (Olson White), and Majin Bone (Kengo Ryūjin). Aside from anime, Tanaka has also voiced roles in games such as Persona 5 (Junya Kaneshiro) and JoJo's Bizarre Adventure: All Star Battle (Tamami Kobayashi). For a pure Hollywood action movie, there have been few better in recent times than John Wick, starring Keanu Reeves. The movie is getting a sequel, with John Wick: Chapter 2 arriving in cinemas early next year, and to which a trailer was released over the weekend. But it seems as though plans are afoot already for a third film. Director Chad Stahelski confirmed this to Collider, saying that “the studio has asked us to put our heads together and see if we can come up with something”. He added that Ian McShane’s character, Winston, “is a big part of the next one, so is Lance Reddick. We’ve got some ideas”.